We first met Günter and his family on a tour in Vietnam. Günter had been on the trail for about nine months and had been all over Australia, Thailand, Cambodia, Indonesia, and Malaysia. His mother and younger sister traveled all the way from Germany to have a nice pleasant stay with him in SE Asia. We met them on a Saigon City tour. Saigon City Tours operates out of Saigon, Vietnam. Most of their stay was fun and quite uneventful. However, there is one humid Bangkok day they are unlikely to forget. Günter's mother and sister were planning on returning to Germany in a couple of days. We were just hanging out in Bangkok trying to figure out what to do, and then decided to go to one of the beaches on the outskirts of Bangkok on a day trip. 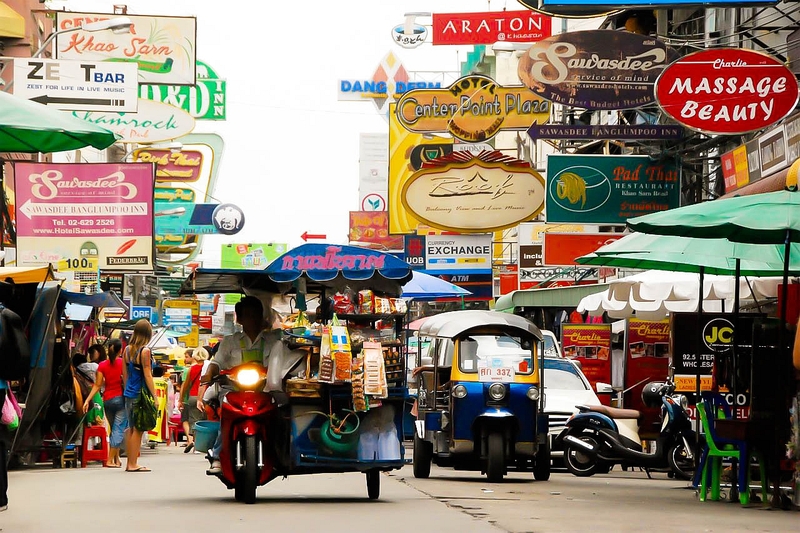 Günter went to a tour agency on KhaoSan Road, the backpackers mecca in Bangkok and arranged everything. An air-conditioned van would pick us up at 8:00AM the next day. Everything looked good so far. We were going to the beach! The next morning arrived and our waiting began. While waiting we managed to have a good breakfast of muesli with yogurt. The kind where they put the honey on top. Always a favorite. Then we waited and waited. Every so often some van would drive up, and assuming it was ours, we'd get up, only to be cut off at the pass by another group of travelers. The "air-con" van didn't arrive until 10:30. Nor was the van "air-con" van really "air-con". Angry but relieved to be on our way; we piled in and trusted our driver to safely deliver us to the beach. It looked like we could make it by 12:30, still enough time to get a tan. The driver sped off and we were on our way. About a half hour into the trip Günter noticed that the driver was going the wrong way. Günter told the driver about our apprehensions and the driver told us not to worry, that he knew just where he was going. And he did know where he was going; it just wasn't where we thought we were going. Nor was it where we should have been going. He eventually turned into a hotel parking lot. It turned out that we were there to pick up an Indian family. The father of this particular Indian family was extremely angry. First of all, the van was now over three hours late in picking him up. Second, the van wasn't air conditioned. His little girl, who was about nine years old, stuck her head in the van and proclaimed "This will not do. It's much too hot." The father began to argue with the driver and the manager of the hotel where he had booked the trip. They stood there arguing for about half an hour while our group waited in the van. Finally, the manager got him another ride to the beach. Our driver got back in the van and started the engine. We were on our way! Only problem was that it was now about 11:30 and getting the chance of getting to the beach at a decent hour seemed more and more remote. We discussed this situation among ourselves. The driver of the van spoke very little English and didn't seem to understand our discussion. Our final decision was to give up and return to KhaoSan Road. We then asked the driver to turn around and give us our money back. He refused. We protested. He then called the owner. The driver then offered to take us to the owner's office. We agreed with that. He then started to drive to the owner's office. Upon arriving at the building, the driver did not want to show us the owner's actual office; he wanted us to wait in the van. He took off for the owner's office; Günter and I followed him and watched him go up the stairs of the building. Günter then went up the stairs and actually got to speak to the owner. He refused to give us our money back! Amazing, but true! They decided that they would drive us back to KhaoSan Road. Even though we didn't get our money back (yet! ), we felt that we had no choice but to go. At least that way we wouldn't have to pay for a taxi. Thinking that it was best to deal directly with the travel agency, we got back in the van and started off. A few minutes later, the driver stopped at the side of the road to get some water. He left us in the van. We waited patiently. He was gone about 15 or 20 minutes. While he was gone, I stopped a police car. I tried to explain our situation to the police officer. The officer didn't speak much English. The driver returned and he brought a friend. The driver explained his side of the story to the police officer. Of course, both the driver and the police officer speak fluent Thai. Naturally, we lost. He wouldn't help us but assured us that our driver would take us straight back to KhaoSan Road, with no stops. We adamantly insisted on no stops. The driver agreed. No more stops. We all get back into the van. About fifteen minutes later the driver pulled off the side road again, this time under a bridge. The driver got out and just left. I started to question his friend who had remained seated in the passenger side. His friend assured us that the driver would be gone for only a few minutes. By this time we were more than a little upset. We were getting pretty angry. Fortunately, luck was on our side this time. Foolishly, the driver had left the keys in the ignition! We began to discuss what to do. Knowing we didn't have much time, we immediately decided upon a plan. Günter and I both got out of the van. I started talking to the driver's friend from the passenger side of the van. Günter then walked around the van and took the keys out of the ignition. Everybody else jumped out of the van and ran across a crowded Bangkok street. We grabbed a taxi and got stuck in a traffic jam. The taxi drove by the parked van. Fearing that our van driver would see us, we crouched down in the taxi; but he still had not returned. The taxi driver headed for KhaoSan Road. Once safely back on KhaoSan, we went into the travel agency where Günter had bought the ticket. Günter explained what had happened and asked for a refund. They refused. They began to see our point of view when we showed them the keys. The travel agency then called the owner of the van. He finally agreed to refund our money, in exchange for the keys. Victory! We walked out with our pockets filled with Thai Bahts and had a late lunch at one of KhaoSan Road's many fine eating establishments. Even though we never made it to the beach, we had a far more exciting experience than we ever would have had just sitting in the sand. And that's what great travel is all about, isn't it?